You simply size your log splitter based on the widest logs in your woodpile. 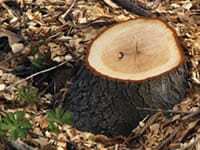 For example, if you plan on splitting 6-inch diameter branches, a small 4-ton log splitter will suffice. On the other hand, if you plan on cracking 2-foot wide tree trunks, you’ll need a large 20-30 ton log splitter. Naturally, harder woods - like oak, walnut, and poplar - will require additional force. Our chart will help you guesstimate how much force you'll need. It's not always accurate, but it's usually pretty darn close. Green logs are freshly cut and still retaining their moisture. They'll look slightly green or yellow in color compared to seasoned wood that looks closer to brown. Freshly fallen wood is very moist and difficult to cut, so it takes more tonnage (or a little more time aging) to split through it effectively. As wood ages, the moisture inside slowly evaporates, making it more brittle. As a result, older firewood splits and burns much more easily. If you plan on splitting green wood, you’ll need either a more powerful log splitter or some old-fashioned, inexpensive patience. 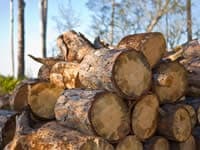 Log Splitter Buyer's Guide.. Our Power Equipment Direct how-to library can help you learn about Understanding the Janka Scale, Proposition 65 Product Labeling and Sales Tax Information.